We are offering digital d.o. 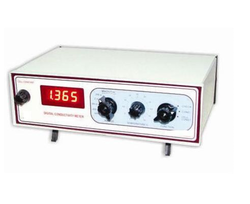 meters with 3½ digit LED display with Gold/Silver probe. Along with Gold/Silver D.O. Probe, RTD temperature probe and 3½ digit LCD display with Gold/Silver D.O. Probe. We offer an exclusive range of Digital D.O. Meters to our customers. These are used to evaluate oxygen liquefy in water and index of biological and physical processes in water.